"Don Q's Love Story" Original Vintage Cover. Click for source. 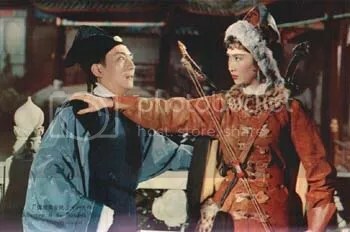 Don Q was created by Kate and Hesketh Prichard and debuted in “The Parole of Gevil-Hay” (Badminton Magazine, September 1897). 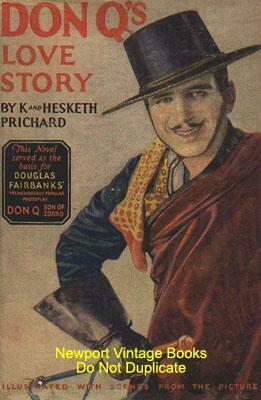 Don Q went on to appear in numerous stories, collections, and novels, which is collected in The Chronicles of Don Q. Hesketh Prichard (1876-1922) was a successful author, big game hunter, and cricketer and was reportedly E.W. Hornung’s model for Raffles. Kate Prichard (1851-1935), Hesketh’s mother, was a novelist, short story writer, and political activist. The Prichards also created Flaxman Low. Illustration by Maxfield Parrish from The Arabian Nights, 1909. 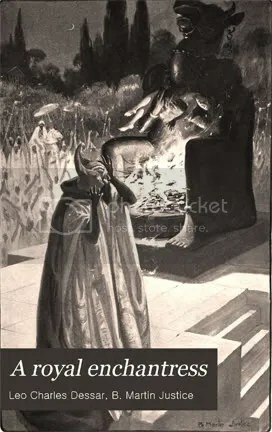 Sufrah was created by Marcel Schwob and appears in “Sufrah, Geomancer” (Vie Imaginaire, 1896). Schwob was also the creator of the King in the Golden Mask and Septima. “Sufrah, Geomancer” is a sequel to the Arabian Nights. 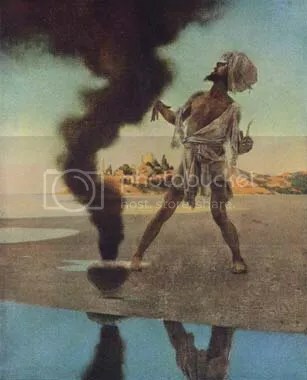 Moghrabi Sufrah is the magician who is Aladdin’s enemy in the Arabian Nights, but as “Sufrah, Geomancer” tells us, at the end of the Arabian Nights Sufrah’s body was not burned black by the drug he consumed, but rather put into a deep sleep. Sufrah escapes from Aladdin’s palace through a window while Aladdin is making love to the princess. But when Aladdin’s palace disappears to China, as happens in the Arabian Nights, Sufrah is left alone in the open desert, without any food or water. Nor does he have any magic charms he can cast or magic items he can use to rescue himself. Hellenes. The Hellenes were created by G.G.A. Murray and appeared in Gobi or Shamo: A Story of Three Songs (1889). George Gilbert Aime Murray (1866-1957) was a scholar of the Classics, a Fellow at Oxford, a playwright, a translator and popularizer of Hellenism, and a passionate liberal, campaigning tirelessly for the League of Nations. Gobi or Shamo is the search for a lost colony of Greeks. Mavrones is a young English scholar who yearns to discover an unknown historical curiosity or treasure. He stumbles upon the possible existence of a lost group of Greeks while perusing a set of manuscripts in a former Byzantine monastery on the Greek island of Arganthus. Mavrones sets out to locate the Greeks, assisted by his friend Quentin Baj, “a man of six feet two, with dark moustaches and a crushing manner, and…further…the possessor of an acer et contemptor animus, with few good-natured weaknesses to spoil the edge of a resolve.” Mavrones, Quentin Baj, and their annoying friend Wibbling set out for Mongolia, and after a series of life-threatening adventures they find the Hellenes. The Hellenes are the descendants of Milesians taken prisoner by Darius the Great after the Ionian Revolt of 499 B.C.E. After five generations of slavery the Milesians fled northward, joined with a group of Ionians, and fled “from the kingdom of the Persians, Northward and Eastward, over the great mountains that lie by the sources of the Indus and Oxus…” They ended up in a remote, mountainous part of Mongolia (“shamo” being the Mongolian term for the Gobi) and settled there, on top of a steep plateau, driving off the local Sanni tribe and forcing a peace on them. The Hellenes have an interesting civilization. They retain the essentials of Classical civilization, but have developed advanced technology. One representation of Agartha, based on writings of Raymond W. Bernard, which assumed that Agartha existed inside the Earth with an opening entrance in the Himalayas. Click for source. Agartha was created by “Saint Yves d’Alveydre” and appeared in Mission de l’Inde en Europe, Mission de l’Europe en Asie (Mission to India from Europe, Mission to Europe from Asia, 1885). Joseph Alexandre Saint-Yves, Marquis d’Alveydre (1824-1909) was a French thinker and mystic, similar to (if less influential than) Eliphas Lévi. Agartha is an ancient underground kingdom in Tibet. The kingdom has a strange effect on outsiders: they either do not notice it as they travel through it, or they forget about it once they have seen it. 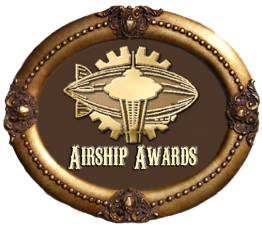 Even so, there are many rumors about Agartha. It is said that its capital, Paradesa, holds the University of Knowledge, where the occult and spiritual treasures of mankind are guarded. Those in charge of these treasures are the Secret Masters, superior beings who are the spiritual leaders of humanity. They are in telepathic communication with enlightened humans around the world, who in turn try to spiritually uplift humanity until “the Anarchy which exists in our world is replaced by the Synarchy,” the proper system of government for all of humanity. Cahina was created by Leo Charles Dessar and appears in A Royal Enchantress (1900). Dessar (1847-1924) was a New York judge who was a part of the corrupt Tammany Hall political system. The Greeks were expelled, but the Arabians were not yet masters of the country. In the interior provinces the Moors or Berbers, so feeble under the first Caesars, so formidable to the Byzantine princes, maintained a disorderly resistance to the religion and power of the successors of Mohammed. Under the standard of their queen Cahina the independent tribes acquired some degree of union and discipline; and as the Moors respected in their females the character of a prophetess, they attacked the invaders with an enthusiasm similar to their own. The veteran bands of Hassan were inadequate to the defence of Africa: the conquests of an age were lost in a single day; and the Arabian chief overwhelmed by the torrent, retired to the confines of Egypt, and expected, five years, the promised succours of the caliph. 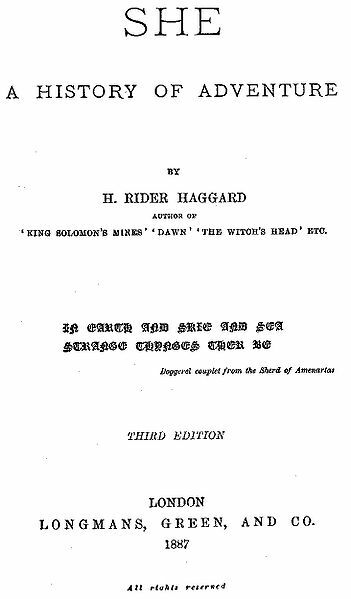 After the retreat of the Saracens, the victorious prophetess assembled the Moorish chiefs, and recommended a measure of strange and savage policy. “Our cities,” said she, “and the gold and silver which they contain, perpetually attract the arms of the Arabs. These vile metals are not the objects of our ambition; we content ourselves with the simple productions of the earth. Let us destroy these cities; let us bury in their ruins those pernicious treasures; and when the avarice of our foes shall be destitute of temptation, perhaps they will cease to disturb the tranquility of a warlike people.” The proposal was accepted with unanimous applause. From Tangier to Tripoli the buildings, or at least the fortifications, were demolished, the fruit trees were cut down, the means of subsistence were extirpated, fertile and populous garden was changed into desert, and the historians of a more recent period could discern the frequent traces of the prosperity and devastation of their ancestors. Such is the tale of the modern Arabians. 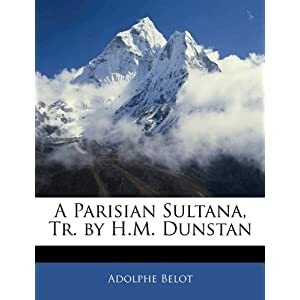 In the foreword to A Royal Enchantress Dessar wrote that he was struck by Gibbon’s passage: “the meager account of this beautiful Prophetess Queen of the Berbers was inspiring, yet irritating: it suggested so much, yet told so little.” From this Dessar spun an entertaining historical fantasy. 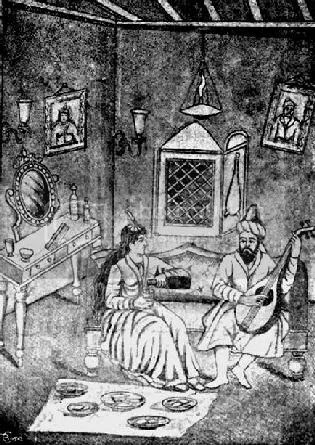 Hajji Baba enjoys the company of Zeenab. After Ḥabl al-matin Persian tr., Calcutta, 1905, opp. p. 142. Caption & Image courtesy of Encyclopaedia Iranica. Click for source. Hajji Baba was created by James Morier and appeared in Hajji Baba of Ispahan (1824) and Hajji Baba in England (1827). Morier (1780-1849) was a British diplomat, adventurer, and author. He first went to Persia in 1807 and visited it and surrounding countries several times over the next decade. His desire to write something in the Persian style of Arabian Nights produced Hajji Baba of Ispahan. Hajji Baba is a charming rogue, someone who began life as a barber/surgeon but whose wanderlust and desire for money led him to leave home on a caravan when he was only sixteen. But the course of roguery doth ne’er run smooth, and he is almost immediately captured by a band of Turcoman bandits. Hajji Baba lets himself be captured a second time by a shahzadeh (prince) and is taken to Meshed, where he becomes a water carrier. Hajji Baba sprains his back carrying water–his boastfulness leads him to take on far too much weight, including that of his main rival–and so he becomes an itinerant vender of smoke. But he cuts his tobacco with dung once too often and is caught by the Mohtesib (“the Mohtesib is an officer who perambulates the city, and examines weights and measures, and qualities of provisions”) and bastinadoed for his fraud. So Hajji Baba becomes a dervish, telling colorful stories and shaking down listeners for money; he stops in mid-story, just when things are getting good, and asks for donations in exchange for his continuing. He then becomes a doctor to the Shah of Persia, a position he loses due to an imprudent love affair. And so on and so forth, for hundreds of pages, through colorful stories and attractive boasts and genial swindles and painless mendacity and jovial hypocrisy and maidens fair and wry observations at the foibles of the mighty and the poor.